The DeviceNet master terminal EL6752 corresponds to the Beckhoff FC5201 DeviceNet PCI card. 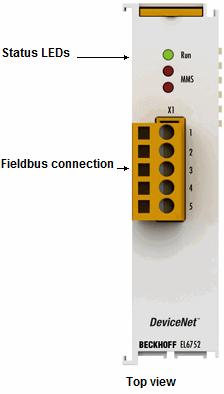 Due to the connection via EtherCAT, no PCI slots are required in the PC. Within an EtherCAT Terminal network, the EL6752 enables the integration of any DeviceNet devices and can either be master or slave. The EL6752 is optionally also available as a slave version.